Posted October 8, 2013 by laurielmorrison & filed under Middle Grade Literature, Series on creating engagingly fallible narrators, The Writing Process. Today I’m back with the final post in this series about creating an engagingly fallible first-person narrator. We’ve gone over four strategies for helping readers to recognize a first-person narrator’s fallibility; writers can incorporate narrative distance, construct an audience and purpose for the narrative, make the most of syntax and diction, and have the narrator omit details or emotional reactions. Now we’re ready for my final strategy! Authors can also create secondary characters that act as measuring sticks for the main character’s behavior and views. 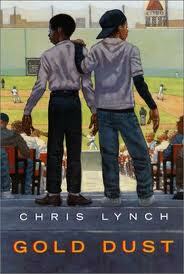 Last week, I described Chris Lynch’s novel Gold Dust, which takes place in 1975 Boston and tells the story of Richard, a boy who loves the Red Sox and wants his new friend Napoleon, a black boy from Dominica, to ignore the racism he faces and embrace the sport of baseball. Lynch uses two secondary characters, Beverly and Butchie, to make readers think twice about accepting Richard’s views at face value. Beverly is an enlightened girl who acknowledges the racism in her neighborhood and becomes Napoleon’s girlfriend. Throughout the novel, she points out the problems with Richard’s behavior, both to Richard and to the reader. When Napoleon gets sick after spending too much time playing baseball outside with Richard, Beverly says, “Napoleon is from a tropical climate. […] You could kill him, forcing him to be like you” (132). On the surface, Beverly just means that Richard could hurt Napoleon by forcing him to spend so much time in the cold, but her statement suggests to readers that Richard could also damage Napoleon by encouraging him to forget his heritage and pretend that racism doesn’t exist. While Beverly is different from Richard because she is more open-minded than he is, Butchie provides another kind of contrast. Butchie’s actions and statements throughout the novel confirm that Napoleon is right: it is impossible for him to block out racism because he cannot escape it. While Richard is well-meaning but misguided, Butchie is downright cruel. Lynch uses these two secondary characters as foils, to show contradicting reactions to Napoleon’s presence and to provide a gauge for Richard’s behavior. Readers can better evaluate Richard’s reliability by comparing him to Beverly on the one hand and to Butchie on the other. If you are writing a first-person narrative, think about whether you might develop secondary characters that function as gauges for your narrator-protagonist, as well, and be on the lookout for such secondary characters in your reading. 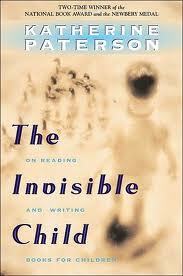 In her lovely essay collection The Invisible Child: On Reading and Writing Books for Children, Katherine Paterson explains that a character in a novel has both a visible self and an invisible self. Internal narration allows readers to see characters’ invisible selves—the parts they keep hidden from others, and maybe even from themselves. Paterson suggests that the writer’s job is to see deeply into a character’s invisible self and to depict that character honestly and lovingly. Paterson explains, “It is my hope, of course, that children will […] be able to see themselves in [these characters] and then as they come to love and forgive these people on the page to be able to love and forgive their deepest selves” (48). Paterson isn’t talking specifically about first-person novels, but this quote gets at the heart of what I like most about a nuanced first-person story. When readers experience a story through the eyes of an engagingly fallible narrator, they can see beneath the surface of the narrator’s account. They can understand, connect to, and accept that fallible character, and that reading experience can help them to understand and accept other people and even themselves. Lynch, Chris. Gold Dust. 2000. New York: Scholastic, 2002. Print. Paterson, Katherine. The Invisible Child: On Reading and Writing Books for Children. Dutton’s Children’s Books, 2001. Print. I love this strategy: “you might develop secondary characters that function as gauges for your narrator-protagonist.” I’ll keep that in mind when I return to my first-person novel. I also love the notion of “see[ing]deeply into a character’s invisible self and to depict that character honestly and lovingly.” I could definitely go deeper in my current novel. Is there a novel you’ve read recently (besides your own :-))where the author really probed deeply into the main character? Aww, thanks, Linda! Of the books I’ve read recently, I think Rainbow Rowell’s FANGIRL does this beautifully (in third-person POV, but no matter). I also think Sara Polsky’s debut novel THIS IS HOW I FIND HER and Lisa Graff’s UMBRELLA SUMMER, which isn’t as new but was new to me, fit the bill (those two are first-person). Okay. You’re the fifth person to mention Fangirl, so I need to read that book! I love the use of the secondary character as the measuring stick. It’s such a great way of not only highlighting the protagonist’s traits, but also placing him or her on the grid among others in his or her world. JK Rowling did this beautifully with Harry Potter, placing both Hermione and Ron next to Harry as measuring sticks. Harry, Hermione, and Ron serve as a trio that shows each other’s strengths and weaknesses. None of them are perfect.